It’s a well known fact for years now that Google doesn’t like to see paid reviews or reviews paid through free product or free service pass PageRank. Till now, Google mostly penalized the other side of things. Online stores who were buying lots of links that pass PageRank would get hit by a manual penalty or even worse, by the Penguin algorithm. Google now decided to focus on those who enable merchants to get such links – the bloggers. So last weekend Google sent out manual penalties to bloggers who didn’t listen to this guideline. What impact does this have on eCommerce merchants? Impact can be both positive and negative, depending on how good you were in obeying Google’s guidelines in past. Till now, if you only obtained a few links with this method where you give a free product or pay for review to a blogger, Google would be unable to figure out that you’re doing something wrong on a massive scale and you wouldn’t get penalized in any way. A blogger that you paid was probably paid by a lot of other merchants as well so if he got caught, all of the similar outbound links on his blog will no longer pass PageRank. This means that it’s possible that even though your store wasn’t penalized, you might rank lower now if you paid bloggers for links with money or free products as those links will no longer pass PageRank to your website and thus your rankings should be slightly or significantly (depending on the strength of those backlinks and their amount) lower. On the other hand, if you were a good guy in Google’s eyes and you didn’t have this kind of interaction with bloggers, since some of your competitors might have been affected by this you might be moving up in rankings as they fall down. Whenever you pay for review or any advertisement on a blog or any other website, links towards your site need to have rel=nofollow and you will avoid any unwanted penalties or manual actions from Google regarding those backlinks. If you’re running an affiliate program, your affiliates also have to link to your online store with rel=nofollow links or other methods that prevent PageRank flow. 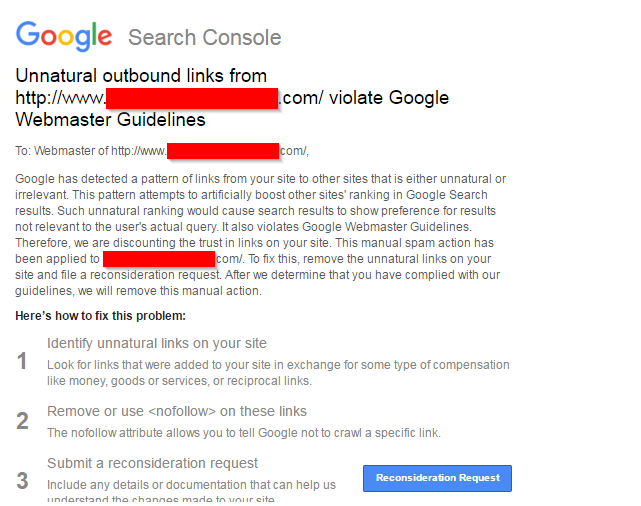 If you’re still confused regarding this, I urge you to read Google’s help section regarding “unnatural links from your site“. Alternatively, we can help you out with our SEO audit – feel free to get in touch! Did you or any of your affiliates get this manual penalty? Last weekend Google sent out a batch of new manual penalty notices that mostly hit bloggers. Google defines a manual penalty as a manual action taken against all. Thanks for the information. If you make the links nofollow, will we not lose all the link juice that they produced? How does google know that the link was paid for? Google says either remove them or place rel nofollow on them. If they’re kind of pure spam and don’t add to your visitors experience, I’d remove them. If they’re in context of the article and add value but they were paid for, I’d just add nofollow to them.